ORTU Gable Hall are still celebrating following their double win at last week’s 2018 Thurrock Education Awards. 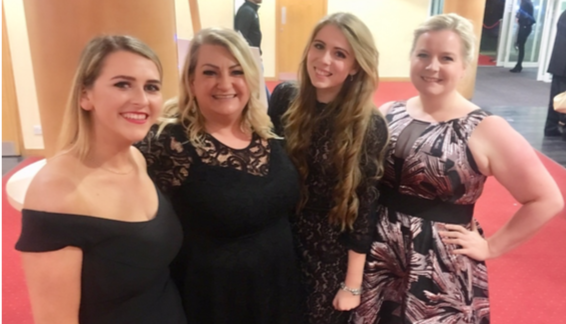 The awards were held at The Civic Hall in Grays last Thursday (22nd November) in a bid to celebrate the successes and achievements of Thurrock’s excellent teachers, leaders and support staff. Kate Merritt was nominated and won the ‘Promoting career pathways and apprenticeships’ category. Kate is described as being dedicated to her job who works tirelessly to support young people into the world of work – whatever their background and ability. Going beyond the school walls, Kate works closely with national and local businesses to promote career opportunities to all of Ortu’s students and Notably, as a result of her work, careers advice was acknowledged as a ‘strong strength’ in the school’s most recent Ofsted report. Karina Latham was nominated for ‘Innovative and Creative Teaching and Emma Absolom was nominated for ‘Outstanding New Teacher’. Charlotte Boileau was nominated and won the ‘Inspiring Leader’ Category after she was described as leading by example, instilling self-belief in children. Impressively, Charlotte is changing the culture of challenge within the entire school – showing qualities of leadership beyond her years. Speaking after the event, Winner – Kate Merritt said: “It’s a real honour to have been nominated for the Promoting Career Pathways and Apprenticeships award again this year.